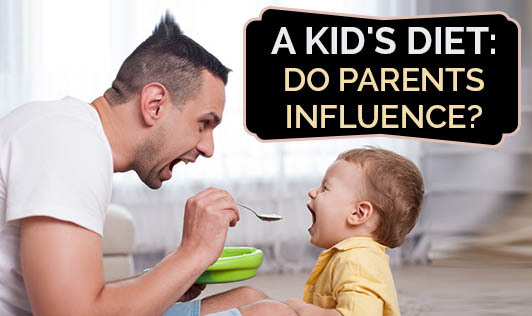 A Kid's Diet: Do Parents Influence? The parental influence on a child's diet is quite strong. From the time children are born, parents have the opportunity to decide what to feed them. As children get older, however, their friends also play a role in what they consume. The first years of a child's life are a time of rapid development and transition from a milk diet to one that involves all five food groups. Parents have a powerful influence on their children's diet through genes as well as providing them with different types of foods they can eat on a regular basis. It is recommended to have regular family meals to be able to influence your children's dietary habits on a daily basis. Children who eat regular family meals are more likely to eat grains, fruits, and vegetables, are less likely to eat unhealthy food, such as snack items. Family meals also provide parents the opportunity to serve as role models of healthy dietary habits. Parents should use their influence on their children's diet wisely by serving fruit or vegetables at each meal. It should be made easy for the children to choose healthy snacks such as low-fat biscuits, puffed rice items instead of giving options for junk food. The amount of sodas and sugary drinks parents offer to their children should be substituted with low-fat milk and water instead. Parents can additionally serve as good role models of healthy eating by eating plenty of fruits and vegetables and not overindulging in sweets and fatty foods.